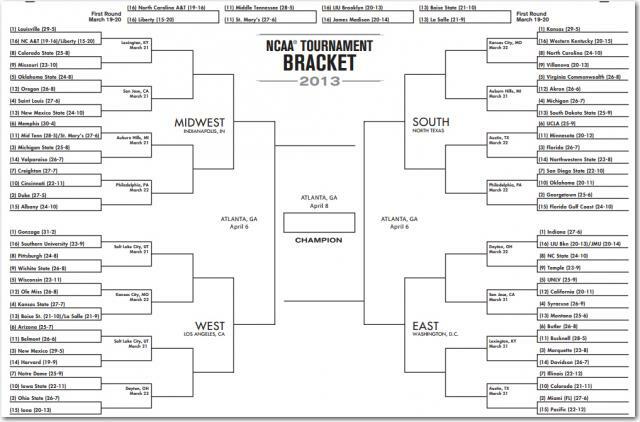 In my previous blog post, I analyzed the madness in this year’s NCAA tournament for games through the Sweet 16. I found that it was one of the wackiest Sweet 16s ever. But things didn’t stop there—the Final Four was pretty crazy, too, having two 4 seeds and a 9 seed! So now that the tournament is over, I want to look back and see what were (statistically speaking) the most unlikely things to have occurred. Was it Florida Gulf Coast in the Sweet 16? Or Wichita State in the Final Four? What about Wisconsin’s horrible shooting performance? Let’s start analyzing the statistics to find out. All probabilities come from a regression model that uses rankings from the Sagarin Ratings to calculate the probability one team has of beating another. Rankings are based on where the team was ranked at the time the game was played. If you really think a 68-team, single-elimination tournament determines the “best team” in college basketball, this number should make you think again. Louisville was the top-ranked team in the Sagarin Ratings, so the regression model favored them in every game. In addition, Louisville got some breaks in their matchups, getting to play Oregon in the Sweet 16 and Wichita St in the Final Four (both of which were weaker teams than you’d normally expect to play in those rounds). And still, they only had a 30% chance of winning all 6 of their tournament games. In other words, despite being the best team in the tournament, there was a 70% chance that Louisville wouldn’t win the title! Hey, remember when this happened? Harvard was actually the Cinderella of the tournament at one point. Then, less than 24 hours later, Florida Gulf Coast beat Georgetown and Harvard was forgotten. Of course, they didn’t help themselves by getting blown out by Arizona in their next game. Harvard winning a game was surprising because it was a 14 seed over a 3 seed. However, we shouldn’t have been that surprised that at least one 14 seed won a game. The odds of all of the 3 seeds winning would have been .79 (New Mexico) * .96 (Florida) * .80 (Michigan St) * .68 (Marquette) = 41%. In other words, there was a 100-41 = 59% chance that at least one 14 seed would win a game. The hard part was just correctly picking which one! For a 4 seed, this probability is actually higher than we would expect. That's because the East Region had very weak 2, 3, 5, and 6 seeds. Syracuse and Indiana (the 1 seed) were actually the two highest-ranked teams in the East Region. I thought this gave Indiana an easy path to the Final Four. But Syracuse had different plans, as their 2-3 zone stifled the Indiana offense and the Orangemen pulled the upset. Other than the Indiana game, Syracuse had a relatively easy path to the Final Four. The model heavily favored them in the 3 other games they won: Montana (88%), California (87%), and Marquette (63%). So while it was unlikely that Syracuse would reach the Final Four, it really wasn’t that shocking. The Ducks pulled off a pair of upsets to reach the second weekend of the tournament. The model gave them the exact same probability of winning in each of their first two games, 33%. So neither game was that big of an upset, but combined it comes out to the 7thth unlikeliest event in the tournament! Keep in mind that La Salle had to win three games to get to the Sweet 16, so that is what makes this probability so low. But shouldn’t that make it a lot lower than Oregon, who only had to win 2 games? Well, La Salle can thank Wisconsin’s horrible shooting for an easier path to the Sweet 16. Because Mississippi pulled the upset over Wisconsin, La Salle had a much easier opponent in the round of 32 than Oregon did. The regression model would have given La Salle only a 22% chance of beating Wisconsin, which is a lot lower than the 35% chance they had against Mississippi. In fact, if you remove the First Four game against Boise State, the probability of La Salle reaching the Sweet 16 was 13%. That actually makes Oregon’s run to the Sweet 16 less likely than La Salle’s! After La Salle beat Boise State in the First Four, the Atlantic 10 had 5 teams in the round of 64. All 5 teams won their game, giving the Atlantic 10 a great start to the tournament. The 5 wins included two heavy favorites winning (St. Louis at 87% and VCU at 70%), two upsets (La Salle at 37% and Temple at 35%), and one coin flip winner (Butler at 57%). When you multiply all those, you get a probability of 4%. Impressive, Atlantic 10! But the impressive streak ended there. In the round of 32, the Atlantic 10 went 1-4, with La Salle being the only winner. Not so impressive. Yep, Florida Gulf Coast comes in at 4th! Bet you thought they’d be higher! The model gave them a 13% chance of beating Georgetown, and a 27% chance of beating San Diego State. So winning both of those games were certainly unlikely, but it wasn’t out of the realm of possibility! We saw before that we shouldn’t have been that surprised that a 14 seed won a game. Can we say the same thing about the 15 seeds? The probability of all of the 2 seeds winning would have been .87 (Georgetown) * .87 (Miami) * .88 (Ohio St) * .93 (Duke) = 62%. So there was a 38% chance that at least 1 15 seed would win a game! Not as good as the 14 seeds, but that’s still higher than most people would expect! We also saw before that it wasn’t terribly unlikely that Syracuse made the Final Four. They were helped by a weak region, and really only had to beat one elite team. The same cannot be said of Michigan. Just to get to the Final Four they had to beat the 13th ranked team (VCU), the 6th ranked team (Kansas) and the 2nd ranked team (Florida). The probability of winning all 3 of those games (plus South Dakota State) was a mere 6%. So you see that they had a much harder path to the Final Four than Syracuse. But unlike the Orangemen, Michigan’s run didn’t end with the Final Four. The Wolverines made it to the championship game, making their run even more unlikely, at 3.2%. But just like the tournament, Michigan isn’t going to bring home the title, as another team outdid their probability. I’m guessing you won’t be shocked to hear who it is. Ha! I bet you thought I was going to talk about Wichita State next. We’ll get to them, but first let’s talk Wisconsin. I went off script a little bit here, but the Badgers’ shooting in their first-round loss to Mississippi was so horrific that I had to look into it. On the season they made 48% of their 2pt field goals. Against Mississippi, they made 8 out of 29, for a measly 27.6%. So what is the probability that a team that normally makes 48% would make 8 or fewer out of 29 attempts? We can use a probability plot to get the answer. The most likely outcome would have been for Wisconsin to make 14 of their 2-point shots in that game. This is represented by the highest bar in the middle. In order to see what they actually did, we have to look all the way down to the left. It’s represented by the red region. 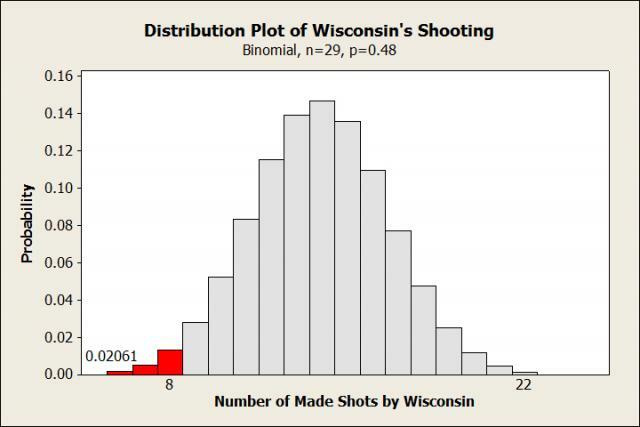 There was only a 2% chance that Wisconsin would shoot as badly as or worse than they did. Making another 6 shots would have given Wisconsin 12 more points. And what do you know, Wisconsin lost by 11. So for all the praise that Marshall Henderson got after this game (he actually shot almost as badly as the Badgers), it was Wisconsin’s terrible shooting that won this game for Mississippi, not Henderson. If Wichita State would have simply gotten to the Sweet 16 and then lost, their run would have still been good enough for 6th on this list. They had a brutal opening game because the Sagarin Ratings loved Pitt, ranking them 10th. Wichita State had a mere 29% of just winning their first game! But after pulling that upset, things only got harder. They had to upset a Gonzaga team that was ranked 7th. After defeating Gonzaga they beat a La Salle team they were favored over, then pulled their final upset over 5th ranked Ohio State. So the Shockers beat 3 top 10 teams in 4 games. That’s pretty impressive, and also very unlikely...for any team! But it was even more unlikely for the low-rated Shockers, who started the tournament ranked 40th in the Sagarin Ratings. By the time the Final Four had started, they had moved up to 20th. It was a tournament full of Madness. From Harvard, to Gulf Coast, to La Salle, the upsets never stopped. But at the end of it all, nobody pulled off anything as unlikely as what Wichita State did. So congratulations Shockers, you are the craziest thing that happened in the 2013 NCAA tournament!